How does a cohesive, loving family cope with a life altering tragedy that has the potential of destroying the very fabric of that family system? Is it possible for the remaining family members to cope with and ultimately accept the tragic loss of a critical family member? 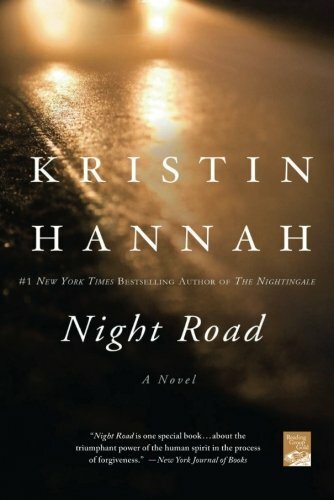 Night Road is an exquisitely written novel that explores the journey of the Farradays, whose seemingly idyllic family is blessed with full lives, laughter, friends, activities a deep and abiding sense of caring and emotional bonding. Most people could only dream about a family such as this in their wildest fantasies and rarely witness one up close and personal. Though these rare glimpses have been captured in colorful pictures similar to those in a Norman Rockwell painting, the closest visuals we may have witnessed have been on television perhaps, with the liveliness of a 1950s show such as “Father Knows Best” or “Leave it To Beaver.” The enclave of families in Night Road appear to be protected from the struggles of modern urban life—drawn together in the strength of common values. But is the Farraday clan as really as perfect as it seems? With mother Judith at home to both nurture and supervise myriad friends and activities of her twins Zach and Mia, life is never dull in the Farraday home. The warmth and vitality exuded by this family attracts every teenager in the vicinity. Judith proudly cherishes her role as mother and willingly tucks her needs away to give all her energies to the twins. The Farradays’ abode is everyone’s home away from home and rarely is there time to get bored or stray from the straight and narrow. Life is just too much fun. Though Judith forms the backbone of the Farrady household, husband Miles is also both a supportive caring and evolved father to the twins, who adores his entire family. Zach and Mia’s lives are replete with cohesive friendships with other teens that they have known since early childhood that further add to their feeling of safety and security outside the home. Each of them has unique interests, exciting afterschool activities and both have also achieved academic successes as well. With impeccable grades and other talents to match, prestigious universities are clamoring for the twins’ attention. The Farrady residence lies on a lush, forest laden island surrounded by beauty to behold as far as the eye can see, creating a wondrous abode for all the residents to behold with awe. Every detail is both colorful and picturesque. Beautifully described was the backyard in the evening that leaves the reader spellbound when Judith “steps outside into the emergent light as her backyard glistened with dew and lush green grass sloped gently down to a sandy gray-pebbled beach. Beyond it the Sound is a series of charcoal-colored waves that rolled and rolled—their peaks painted orange by the dawn.” The spectacular view is one of a mountain range that formed a jagged line of pink and lavender. After absorbing the magnificent details of both hearth and home at the Farradays, one begins to wonder whether any family can sustain such perfect harmony all the time. Upon closer examination into this “perfect family” the reader begins to question why mother Judith has orchestrated every moment of her twins’ lives down to every minute detail from tracking their movements, friends, and homework assignments. There appears to be a more complex reason than a deep abiding love for her children. Her strict adherence to constant monitoring seems to arise from an imbedded fear on her part that something could go terribly awry at any moment. As a child herself, she felt completely unloved and she was determined that her children would never have to deal with those feelings. But is there such a thing as too much control to prevent occurrences that are out of reach of a mother’s control? And how does a mother deal with such unexpected life issues? In a magnificently interwoven subplot, a new girl named Lexi enters the life of the Farraday family and is taken in with open arms. A fragile young teenager, Lexi has had a very difficult early life having been left in various foster care settings, but forms a deep and abiding friendship with Mia and slowly learns to trust the safety and security of a loving home. The two girls become inseparable and Lexi is considered a crucial part of the family. Finally, Lexi has the family that she had always wanted and life is even more perfect for all concerned—at least for a while. As teenage love often happens with those within close proximity, Lexi and brother Zach fall madly in love—much to the surprise and dismay of the rest of the family, but the two remain committed and make plans to continue their lives together. Though Mia feels somewhat betrayed because of the secrecy of the affair, eventually all is forgiven and their senior year in high school is full of gaiety and thoughts of their bright futures to come. Then, in one split second, a choice made in innocence alters the course of the every character that we have come to appreciate and admire. If the story ended here the reader would still be left enthralled with the interesting characters in Night Road—all of whom have incredible depth, strengths, and are graced with honest, vulnerable dialogue that makes them come alive. It is a book that is difficult to put down as it cries out to be read during any spare moment. The unpredictable twists and turns are as exciting as hairpin turns in the Daytona 500. Becoming emotionally involved with the characters has consequences for the reader on many levels. In a novel as well written as this one, one becomes invested in the health and well being of those that are beloved. In Night Road, all of the characters have special qualities that make them endearing and slowly and subtly, one begins to cheer for them and become part of their story, if you will. Some readers may find themselves quite nervous about the outcome of the book as the plot slowly winds around a dangerous and frightening curve on Night Road. Though brilliantly character driven, Night Road raises important questions. It is not just another story—another novel to be placed in the library and wistfully thought about. Night Road is one special book that can transform the lives of readers by influencing how they think about certain important life issues. The reader becomes a first-hand witness to the pitfalls of parenthood, mortality, heartbreak, guilt, life choices, grief, forgiveness, and much more. In short, the entire range of human emotions are explored in this excruciatingly painful but hopeful book about the triumphant power of the human spirit in the process of forgiveness.